McDonald’s is running advertisements in Denmark based around Counter-Strike: Global Offensive, with a Mac Jr (I think) meal deemed a ‘full buy’, which seems reasonable. 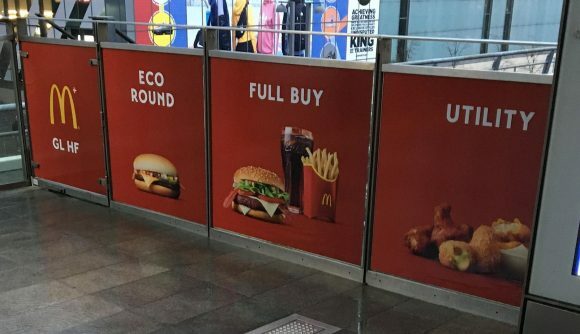 Redditor Kakipls posted a photo of four McDonald’s advertising hoardings, seemingly in Fields Shopping Centre, Copenhagen, to judge by the branding. Besides the full buy, a quarter pounder is an eco round, and extras such as chicken nuggets and chilli cheese bites are utility buys. The fourth panel simply reads ‘GL HF’ beneath the McDonald’s arches – ‘good luck, have fun’, if somehow you don’t know. And indeed, many people wouldn’t. It’s pretty extraordinary to see a brand as mainstream as McDonald’s use such niche gaming vocabulary, or seek to market its products within a gaming context. But then, they know their market. CS:GO has soared in popularity in Denmark lately, propelled by the rise of home-grown sensation Astralis and interest from Danish TV channels, sports teams, and politicians – even the Prime Minister. One comment on Reddit also points out that Field’s centre is the closest subway stop to the Royal Arena, where the next match in the Blast Pro Series will be held this weekend. The venue has a capacity of 12,000, and is sold out. Still, public ads can only be so targeted – plenty of people will walk past those panels and not know what they mean. And even if you don’t like McDonald’s, it’s still pretty cool to see a major global brand calculate that gaming is popular enough to not worry about those who won’t get the reference. Here’s the OP on Reddit, and you can head to Blast Pro Series on Twitch to catch all the action from this weekend. It all kicks off at 18:00 CEST on Friday, November 2, with the grand final starting at the same time on Saturday. Naturally, Astralis are in the mix. Top image by permission of Kakipls on Reddit.